The graphic designer and artist Hans Björklind studied at the Central School of Arts and Crafts (today the University of Art and Design) in Helsinki from 1925 until 1929. He was a student of the artist Alfred Finch. After completing his studies Björklind set up an advertisement agency with Börje Barkman and Rafael Skurnik called Mainos-Mono-Reklam. 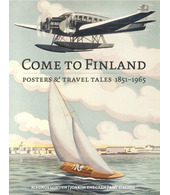 However, due to the economic problems prevailing in Finland at the time, the firm was short-lived. In 1930 Björklind was employed by the advertisement agency Oy Erwin, Wasey & Company Ltd (from 1933 known as Erva-Latvala Oy), where he became studio manager in 1950. Since Björklind was interested in the opportunities and solutions offered by new technology, he made sure that Erva-Latvala kept itself up-to-date with the latest production techniques on the market. He worked for the company until he retired in 1968. Björklind also made a significant contribution as a graphic designer. In addition, he was a driving force behind the professional and industrial organisation of the upcoming advertising industry.